Students kicked off the next step in their campaign for socially responsible investing on the University's part. Students for a Socially Responsible Investment Committee (Students for SRIC) made their campaign public yesterday to boycott the senior class gift in protest of the University’s investment decisions. The group gathered in Reynolds Club around 1 p.m. to kick off their campaign, making the “Senior Class Gift Withholding Pledge” live online for students to sign. They had 179 signatures by late Monday night, 71 of which are from seniors. This is the campaign’s next step after a referendum for SRIC last year gained student support but did not lead to a policy change. 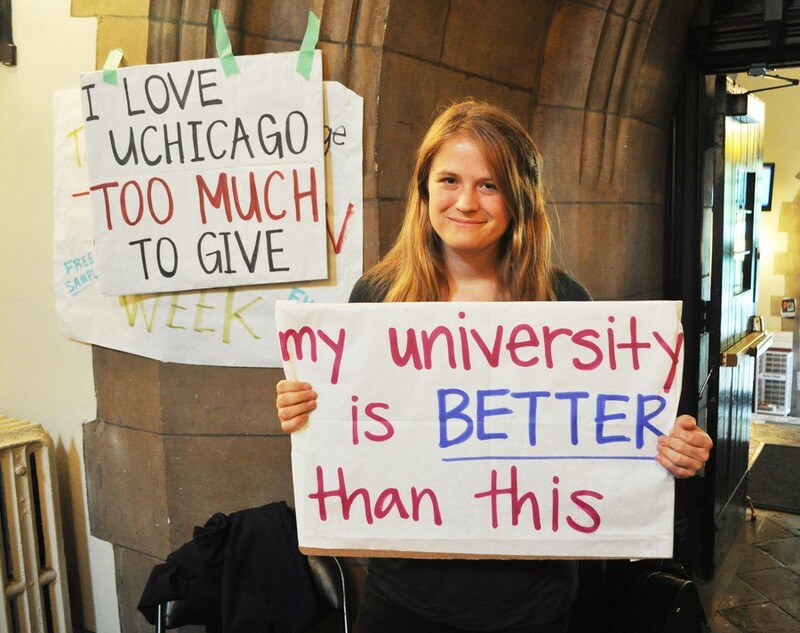 Fourth-year Caitlin Kearney, a primary organizer of the campaign, said that the goal is not to hurt the University—according to Kearney, the Senior Class Gift makes up less than .01 percent of the operating budget, not the endowment—but to send a message. Kearney said the group will continue collecting pledges through graduation and show them to the administration in the hopes that the University will re-evaluate its investment policy. Because the Senior Class Gift does not affect the money that is actually invested, fourth-year and Senior Gift Committee co-chair Shola Farber pointed out that students can support socially responsible investing while still contributing to the senior class gift. Farber also said that since anyone, from first-years to graduate students, can sign the pledge, she suspects the campaign will not have a huge effect on participation. The committee’s goal this year is for 85 percent of seniors to contribute to the class gift, which would exceed the Class of 2010’s record high 81 percent participation rate. Even though the gift does not affect the endowment, Kearney said the point is to show that students want to be proud of where their money goes, now and in the future. The campaign is not in support of a particular divestment, though the pledge itself cites investments in Arch Coal and HEI Hotels and Resorts, which the pledge says have respectively violated environmental regulations and workers’ rights. The letter also mentions the University historically refusing to divest from companies connected to apartheid in South Africa and the more recent genocide in Darfur. The Kalven Report, which guides the University’s neutrality on political issues, has often been used to explain these decisions and preclude the University from using its investments to take a political stance. However, students for SRIC maintain that the campaign is important. Fourth-year Louis Smith signed the pledge though he is not usually involved in activism on campus. “I find the idea that I indirectly invested in [Arch Coal, HEI, and other companies] offensive,” he said.